Rincón has so much diversity it was a bit tough coming up with a list of what not to expect to find in the area. Of course it’s inland an a volcano so there are no beaches but even that’s less than an hour away so you could pop down for the sunset after lunch. The trail along the crater rim of Rincón de la Vieja disappears into the distance. This area is currently off limits to tourists. Starting in 2014 and continuing into 2019 the trails to the crater rim and Von Seebach north from Las Pailas, west from Santa Maria and south from Dos Rios have all been closed due to high levels of activity. The full loop is one of the great hikes in Costa Rica but it’s unlikely to ever re-open. Even if the volcano quiets enough (there was a significant eruption Jan 2019) the trails have not been maintained for five years and would need to be completely re-built from scratch. The parts of Rincon that you can drive to are lower elevation pasture and tropical dry forest. 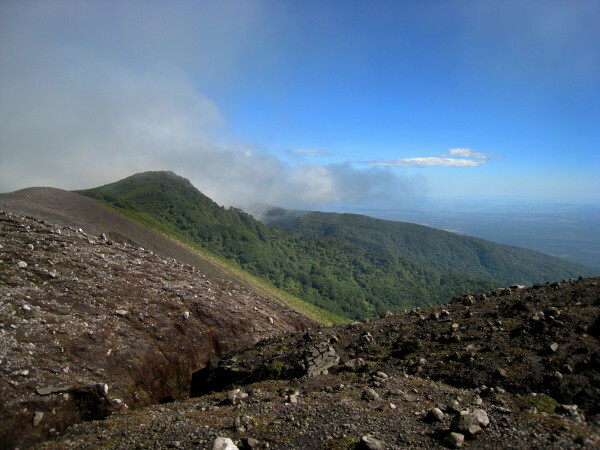 If you want to see the rain forest or elfin cloud forest you’ll have to walk several kilometers. For the cloud forest you’ll also have to wait until the high elevation trails re-open (see above). The National Park is closed on Mondays. There are plenty of other things to do in the area but make sure you plan accordingly. There are half a dozen really nice superior rooms at Hacienda Guachipelín and they have a nice little pool but it hardly qualifies as a resort. Most lodging in the area is eco-ranch rustic and although most also include meals (no other restaurants around) they aren’t what most people think of as All Inclusive.